My last morning came after a big storm blew most of the night. 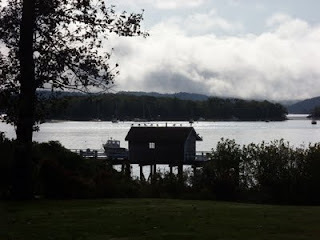 When the sun rose, the clouds started to break up, giving me this sparkling view of Castine Harbor from my window. 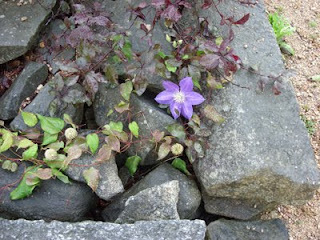 As I headed off on my walk, I spotted a clematis still in bloom on the rock wall. The breaking clouds provided a dramatic backdrop to the above shot as I returned from my walk. Those little dots you see atop the building are birds lined up. 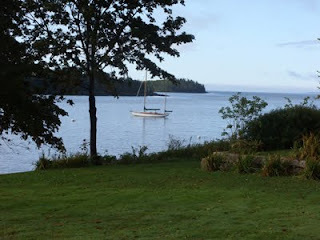 Looking out to the mouth of Castine Harbor is this idyllic shot of a sailing vessel at anchor. I am sure it was tossed about all night as the winds whipped the coastline, but one would never know it the next morning. 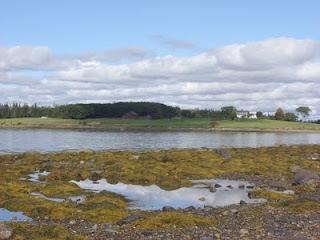 After I checked out, I headed for Wadsworth Cove for another walk. The beach was deserted as I made my way this side of the cove. I adore this view with the big old house, what I believe is a red barn (in the shadow in the middle) and then the little white area at left, which I think may be a cemetery plot. 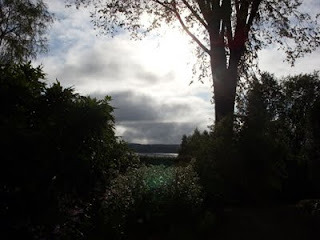 The cloudy sky kept the play of light and dark whipping over the landscape while I walked, making for a beautiful display. My big reward, however, was when I reached the far end of the main beach. 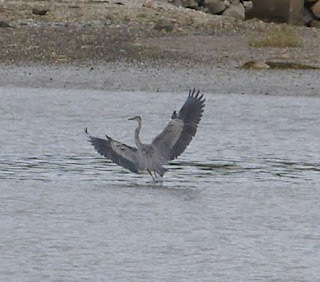 I spotted a Great Blue Heron walking in the shallows. I kept getting closer and then it finally flew to get farther away from me. I just pointed the camera and kept shooting, surprising myself when I saw I got this shot of its full wingspan. It was a wonderful way to end my long-awaited getaway.